FOOTBALL: A LAST-minute penalty from Hartley Wintney’s Ryan Stephens condemned Phil Ruggles’ Knaphill to a miserable Bank Holiday weekend, writes Lewis Winter. The Knappers were comprehensively beaten at home by Ashford Town 4-0 on Saturday, their third home loss of the season, so needed to up their game for the trip to the Memorial Ground. They certainly put in a better performance and should have taken the lead in the first half, but for former Hartley Wintney player Ricky Hogsden to miss a couple of chances to put his new side into a much deserved lead. The second half was much more even, but there were still chances for Knaphill to score, which they squandered. And when Jason Palmer won the hosts a penalty with less than a minute remaining, Stephens made no mistake from the spot to give his side all three points. 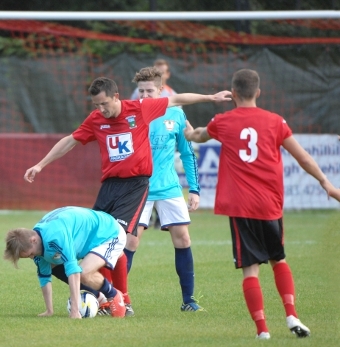 Knaphill will have to bounce back this Saturday, when they come up against Badshot Lea in the Preliminary Round of the FA Cup after defeating Fairford Town 3-1 in the previous round. KNAPHILL: Shelley, Taylor, Morris, Ruggles, Taylor, Hogsden, Patterson, Johnson, Costello, Watkins, Thorogood, Postance, Green, Daltrey.